Elon Musk Unveils High Speed, Tesla-Launching Tunnel Under L.A. Almost exactly two years to the day after Elon Musk announced his tunnel construction enterprise the Boring Company, he unveiled the finished first stretch of high-speed tunnel in Hawthorne, California. 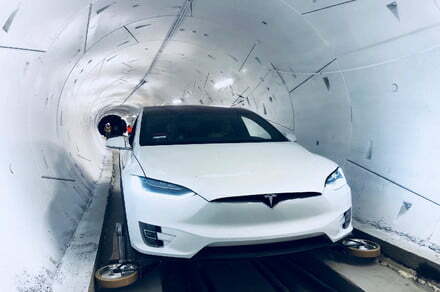 The 1.14-mile demonstration tunnel, which reportedly cost around $10 million to construct, was used to ferry members of the media at speeds of up to 50 miles per hour in a Tesla Model X SUV, modified to fit onto a special track. The demonstration took place Tuesday night, December 18. In the future, Musk has said that he hopes it will be possible to transport people at a hair-raising 150 miles per hour. The track should also be able to support ordinary electric road cars belonging to users, so long as they have undergone a slight modification. Musk first described his ambitions for the Boring Company back in December 2016, after which the company started initial work on what would become the Hawthorne tunnel in February the following year. The excavation work took place on the premises of SpaceX’s offices in Hawthorne. Musk has described the Boring Company as more of a personal hobby than a major expenditure of his time, such as SpaceX or Tesla. Going forward, the hope is that the Boring Company’s demonstration tunnel will serve as a showcase for how similar high speed tunnels could become part of city infrastructure to make transportation speedier. A deal was signed with the City of Chicago in 2016 to build a tunnel between the city’s business district and O’Hare Airport, around 17 miles away. However, assorted regulatory hurdles have meant this project has not received the official sign-off. The idea of a fast transit tunnel between Dodger Stadium and a transit hub in Los Angeles has also been mooted. This isn’t Musk’s only project exploring ultra-fast transportation, either. In September 2017, Musk described yet another project that would involve using SpaceX’s rockets for astonishingly speedy city-to-city transportation. Should all go to plan, Musk’s ultimate ambition is to make it possible to travel anywhere on the planet in less than an hour. Whatever else you can say about Elon Musk, clearly the dude really, really hates being stuck in traffic.